"New condo sales soared back in 2014 from their 2013 slump, with developers across the GTA recording their third-highest level for sales ever, behind the previous highs of 2011 and 2007, according to market research firm Urbanation. At the same time, construction hoardings came down and lanes of traffic reopened in spots, as a record 20,809 condo units were actually completed, some 86 per cent of which had been pre-sold. 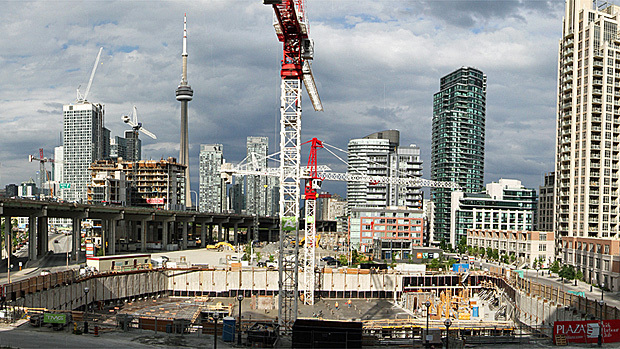 Almost 52,500 new condos were under construction in some 198 new projects across the GTA as of the end of 2014, Urbanation said in a year-end report released Monday. An additional 28,447 units are in pre-construction projects that went up for sale last year and are already 69 per cent pre-sold. Even the resale-condo market showed stunning strength, with sales up 14 per cent in 2014 to a record 17,819 units. Resale prices were also up, coming in 3.8 per cent by the end of 2014 over 2013, to an average of $431 per square foot or $389,000. Rental demand was also up and investor interest in Toronto’s condo market remained strong as first-time buyers found themselves increasingly priced out of the low-rise house market across the GTA. The average selling price of a new condo reached $560 per square foot across the GTA in the fourth quarter of 2014, the strongest rate of growth recorded in two years and up 3.6 per cent over 2013."